We ask God, "Why?" We ask each other, "What can be done?" We wonder what kind of response there can be to this horrifying new reality, the spirit of takfirism, the mindset that makes religious accusation of others into a way of life, enforced by death and suffering for those who do not measure up to the ideology of these armies that sweep across that ancient, sanctified land. Last weekend I visited parishes and college students in the Baltimore, MD area. While I was there, Orthodox clergy and faithful asked that I offer a response to what’s going on in the Middle East. Attached is my response. Special thanks to Fr Andrew Damick for his contribution to what you’ll read here. In recent months, images and stories of Christians being killed for their faith in the Middle East have flooded our news sources and dominated our social media. We see beheadings and shootings, sometimes available as gruesome videos on the Internet that are intended by their makers to inspire some to join their cause and others to cower in fear. We have seen bishops kidnapped, priests shot in the street as they ministered to the suffering, and innocents lined up and had their heads sawn off with knives. Christians are not the only ones suffering in the Middle East—Muslims, Druze, Yazidis and others are also being targeted by the armies oftakfirism. 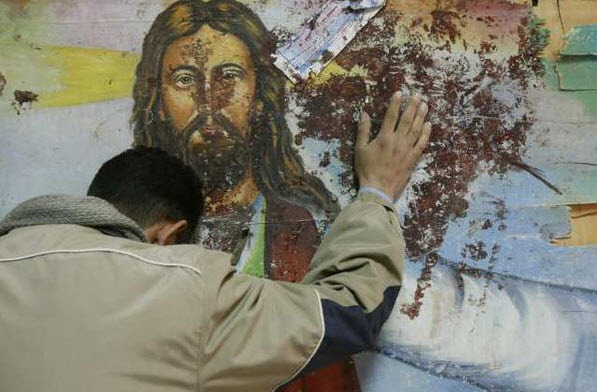 They are also dying for their faith, and even though we Christians do not share their religion with them, we still suffer with them in solidarity, because Christ still died and rose from the dead for them, even if they do not believe it. We ask God, “Why?” We ask each other, “What can be done?” We wonder what kind of response there can be to this horrifying new reality, the spirit of takfirism, the mindset that makes religious accusation of others into a way of life, enforced by death and suffering for those who do not measure up to the ideology of these armies that sweep across that ancient, sanctified land. How are we to understand what is happening? There is no shortage of analysis in the news and debate among our political leaders. But their answers do not satisfy, do they? Christians who belong to the Orthodox Church are well acquainted with martyrdom, even if we ourselves do not live in places where our family and friends are being killed for Christ. Martyrdom forms the whole narrative shape of our history. Our calendar of saints is filled with thousands of martyrs’ names, and there are millions more whose names we do not know. It was martyrdom itself which gave rise to our whole concept of having publicly venerated saints. And while we often think of martyrdom as something belonging primarily to the early history of the Church prior to its legalization in the fourth century Roman Empire, there were many martyrdoms that followed as once-Christian lands were conquered and a new order set up. And the twentieth century also saw martyrdom of Christians with the advent of Communism especially in Eastern Europe, on a scale likely greater than all previous martyrdoms combined. But it is not much comfort to look at these terrifying images from the Middle East and to say, “Yes, we have seen this before.” There is nevertheless beauty and hope that we can find in all this, and it comes from this historic experience of martyrdom which Orthodox Christians know intimately. The persecutors of Christians have always seen them as a threat to their own societal order. Most Christians have not been killed merely as an act of hatred. Rather, Christians were seen as a threat to pagan Rome. They were a threat to the Muslim conquerors, first the Arabs and then the Ottoman Turks. They were a threat to the Soviets, whose extermination of Christians was the most “successful” of all. This threat was manifest in how the martyrdoms usually went—the opportunity is given to conform to the religious/ideological order of the day, whether pagan or Muslim or Communist, and death is given to those who refuse to conform. The current persecutors of Christians are likewise functioning in the same way—their vision of a new Caliphate for Islam in the Middle East has no room for either Muslims who are not conforming to their interpretation of Islam nor for Christians or people of other religions, and their denunciations and accusations of those who refuse to conform motivate them to kill. This is the source of this Arabic term takfir—the accusation of infidelity to the proper order of society. We should note here that not all pagans, Muslims or even Communists have treated Christians as a threat. There have been periods of peace in all those societies, where co-existence was possible. But we are addressing here specifically those for whom peace and co-existence is not possible, those for whom anyone who does not bow to their ideology must be eliminated. So why is the Christian a threat? It is because he believes in the resurrection. Christianity is the only faith in the world whose seminal, defining event is the death and resurrection of the God whom we worship. And we believe that we can be joined to His death and therefore also His resurrection. We can join Him in the conquest of death itself. And if death itself can be conquered, that means that no king, no emperor, no premier, no president and no caliph can claim ultimate power over us. Just look at the responses of the martyrs: They sometimes laugh in the face of martyrdom. Sometimes, they sing. Sometimes, they go out preaching. They so very often go out with the name of Jesus on their lips, praying even for those who are killing them. They go out with joy! So while we feel the pain of their loss and grieve in our hearts for them and their families, and while we pursue all that we can to bring peace to that troubled land, we do not “grieve as those who have no hope” (I Thess. 4:13). An earthly power may slay the bodies of Christians, but he can have no ultimate power over them, for they have joined their risen Savior in the conquest of death itself. We grieve the death of the martyrs, but our grief will be swallowed up in rejoicing. We rejoice with them in their victory over temptation, their victory over the cares of this world, their victory over even death, “the last enemy” (I Cor. 15:26). O Death, where is your sting? O Hell, where is your victory? Christ is risen, and you are overthrown! Christ is risen, and the demons are fallen! Christ is risen, and the angels rejoice! Christ is risen, and life reigns! Christ is risen, and not one dead remains in the grave! For Christ, being risen from the dead, is become the first fruits of those who have fallen asleep. To Him be glory and dominion unto ages of ages. Amen. (Paschal Sermon of St. John Chrysostom).